Built by the Jesuits between 1584 and 1601, on the area of Palazzo dei Sanseverino. 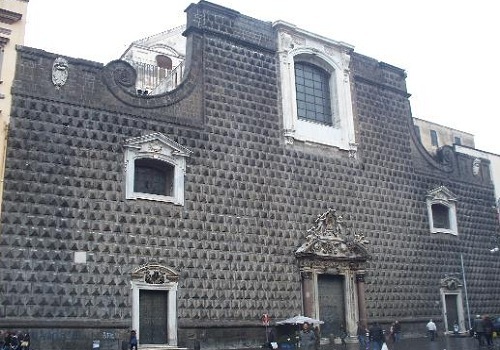 It is characterized by the pyramid-shaped ashlar stones on its facade, whose carvings are said to be esoteric symbols, the Chiesa del Gesù Nuovo, dating back to the 16th century, is considered one of the city’s greatest examples of Renaissance architecture. Its frescoed barrel-vaulted interior, the result of a 17th-century spruce-up, features works by a trio of Naples’ big-name baroque artists – Cosimo Fanzago, Luca Giordano and Francesco Solimena. The entrance to the church is followed by a feeling of profound awe and wonder at the extraordinary wealth of decorative interior that despite the dominant tone baroque, was carried out in a period from the early seventeenth century to the twentieth century. The Gesu' Nuovo appears therefore as a kind of treasure chest that holds the widest possible repertoire of Neapolitan artistic production, the realization of which concurred not only established protagonists such as Giovanni Lanfranco, Cosimo Fanzago, Luca Giordano and Francesco Solimena, but also many artisans, such as carvers, stonemasons, plasterers and painters who with their skill contributed to the magnificence of the church. 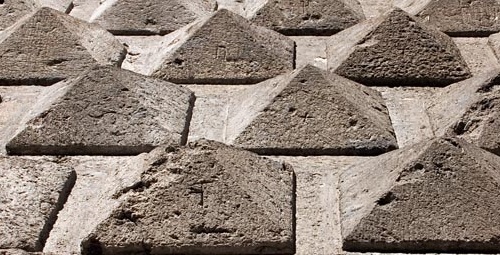 The mysterious signs of the Gesù Nuovo: During the Renaissance period in Naples there were some "experts" stonemasons that is believed to have had the power to charge the stone used for the facade with positive energy to ward off negativity. This mystery concerns the diamond shaped stones that form the facade of the church on which were engraved strange signs of about 10 cm. Legend has it that, because of inexperience or even bad faith of the builders the stones were placed in the wrong way and that, therefore, the positive energies were transformed into negative. In fact, the following years witnessed the destruction of the building by a fire in 1639 and several collapses of the dome. Yet during the Second World War happened a "miracle": a bomb fell on the ceiling of the nave and failed to explode. A study has confirmed however that the signs on the stones are letters in Aramaic (the language spoken by Jesus), and each corresponds to a note. If read from left to right, from the bottom upwards, the incisions compose a music lasting approximately one hour. Listen to the video below. 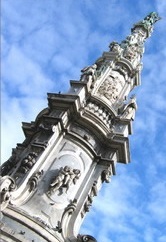 La Guglia dell'Immacolata Concezione (the obelisk of the Immaculate Conception) : The baroque Spire is the most famous of the obelisks in Naples. Its construction in the center of the square provoked negative reactions from the Duke of Monteleone who feared that the structure would collapse on his palace in the event of an earthquake. With the anniversary Immaculate Conception, December 8, the crowd gathers at the foot of the monument to watch when local firefighters lay a wreath on the head of our Lady. A strange legend along to popular belief, suggest that at certain times of the day, thanks to a special play of light and shadow, one can catch a glimpse of the statue taking on the image of death. Test your eyes and look at the statue from behind the result may surprise you. After 1639’s fire Cosimo Fanzago took care of the restoration that gave the church its Baroque look. In 1771 Ferdinando Fuga directed some reinforcement works of the structure. 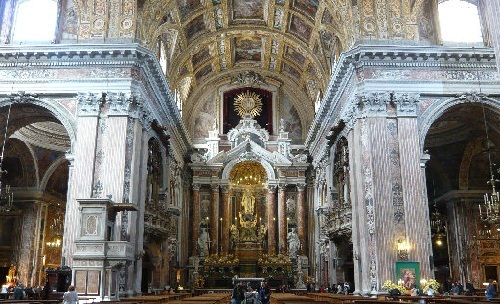 The church’s interiors, typically Baroque in style, has a Greek-cross plan, three naves and walls covered by polychromatic marbles. 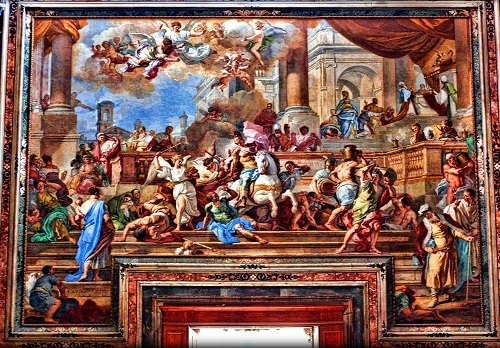 Many frescoes of great value among which La cacciata di Eliodoro dal tempio, of Francesco Solimena (1725) positioned inside on top of the portal and vault paintings by Paolo De Matteis and Belisario Corenzio. The interior is sumptuous with lots of polychrome decorations and precious marbles. In all there are eleven side chapels with altars, which are also rich in decorations. The frescoes are truly gorgeous. But what completely enraptures the eyes is the main altar, a precious jewel, built in 1854. At the center emerges the majestic statue of the Virgin resting on a large globe next to six imposing columns of colored alabaster. In the chapels, precious canvases of Massimo Stanzione and Giuseppe Ribera. The sculptural apparatus is very rich and realized by marble workers that have started working from the XVII century on, creating the polychromatic marble floor and the marble covering of all the church’s walls.